Throughout medieval Europe and beyond, the handgun changed how wars were fought, and tomorrow (Saturday 14 March 2015), the world’s earliest example of this new technology found on a medieval battlefield will go on display at York’s Richard III Experience. 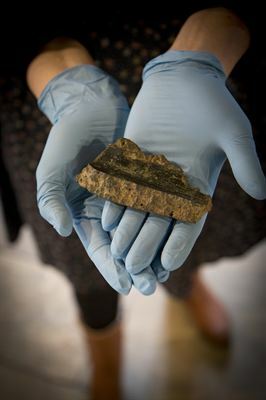 The fragment of a handgun’s barrel was discovered five years ago by metal detectorist Simon Richardson on site of the Battle of Towton, which was fought on the 29 March 1461. Whilst initially, Mr Richardson suspected that it might have been a part of later agricultural equipment, tests have confirmed that it was part of a handgun with traces of early gunpowder still detectable within the metal. With the battle taking place in March, Mr Richardson speculates that the gun’s explosion could be due to its first use of the day. “If the cold metal of the gun was rapidly heated by the detonated gunpowder, this could very easily have caused the whole weapon to blow apart – and the substantial nature of the weapon means that it may well have severely injured or killed not only its owner, but also those around as sharp fragments of metal exploded throughout the air,” says Mr Richardson. Over 20 years after the massive bloodshed at Towton, Richard III ordered a chapel to be built on the site where the soldiers had fallen and were hastily buried. The chapel was not completed during his life, and the chapel quickly fell into decline, with much of the stone taken and used in other projects, leading to the chapel’s exact location being lost over the years. Its location was not rediscovered until 2014, when stones from a late 15th century high-status religious structure were found, believed to be the last remnants of Richard III’s Towton chapel. Those stones are also on public display for the first time as part of the new exhibition. Another recent discovery – the skeleton of a man found at York’s Knavesmire – joins the displays at the Richard III Experience this weekend. Thought to be the body of a Lancastrian soldier captured at Towton and then taken to the Knavesmire for execution, the skeleton shows signs of unhealed injury – an arm broken about three weeks before the soldier died – and compression fractures in his spine, which suggest a life of hard physical work or fighting. The Richard III Experience is open 10am – 5pm between April – October; and 10am – 4pm in November to March. Admission to the Richard III Experience is £3.50 per adult, £2.00 per child, with a Family Ticket priced from £9.00. A ‘Medieval Pastport’ is also available, providing a great value ticket for visiting all of the JORVIK Group attractions.